When we blink, the tears lubricate, nourish and protect the front of the eye. Tears have three main components: The lacrimal gland produces a watery component glands in our eyelids produce an oily component, while other cells produce a mucus. These mix together to create a film which covers the white of the eye and the cornea. When we blink, the film is wiped across the eye by the eyelids. If insufficient tears are produced or the constituents are out of balance it can result in sore, dry eyes. Wearing glasses or sunglasses can help to reduce tear evaporation. Instilling artificial tears can also help. In some cases, the tears can be kept in the eye for longer by plugging the tear ducts. 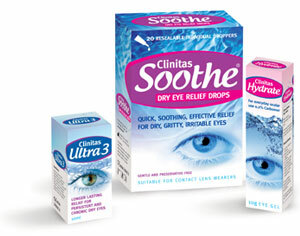 Clinitas Soothe is a gentle preservative-free eye drop in easy to use daily re-sealable droppers. They are a safe and convenient way to add moisture and increase comfort. They are also suitable for contact lens wearers. Ask us about this product on your next visit to Ridings Opticians.